From the time of creation (Job 38:7) to the consummation (Rev. 21:12), angels have figured prominently in executing God’s purposes. The following summaries highlight the ministries of angels to (1) God, (2) Christ, (3) Christians, (4) the church, (5) unbelievers, and (6) the nations. Angels worship and praise God (Job 38:7; Ps. 148:2; Isa. 6:1–4; Rev. 4:6–11; 5:8–13; 7:11–12). They serve God (Ps. 103:20–21; Heb. 1:7). Angels congregate as the sons of God before God (Job 1:6; 2:1) in the “assembly of the holy ones” (Ps. 89:5) and in the “council of the holy ones” (Ps. 89:7). These ministering servants also deliver messages for God. The Lord used angels to transmit his law to Moses (Acts 7:38, 53; Gal. 3:19; Heb. 2:2), and Gabriel took God’s word to Daniel (Dan. 8:16; 9:21), Zechariah (Luke 1:19), and Mary (Luke 1:26). Angels frequently communicated to John in Revelation (Rev. 1:1–22:16). Angels served as God’s instrument of judgment on Sodom (Gen. 19:1, 12–13), and they will evict Satan and his angels at the midpoint of Daniel’s seventieth week (Rev. 12:7–9). Angels will be directly involved in the trumpet judgment (Rev. 8:6–11:19) and bowl judgments on the world (Rev. 16:1–21) during Daniel’s seventieth week. Angels participated in announcing Christ’s birth to Mary (Luke 1:26–38), Joseph (Matt. 1:18–23), and the shepherds (Luke 2:8–15). They protected Christ during his infancy (Matt. 2:13–15, 19–21). Angels ministered to Christ from the beginning of his public ministry (Matt. 4:11) to the end of it (Luke 22:43), and they generally ministered to Christ during his ministry on earth (John 1:51; 1 Tim. 3:16). They helped people understand Christ’s resurrection (Matt. 28:1–2, 6; Luke 24:5–8) and ascension (Acts 1:11). 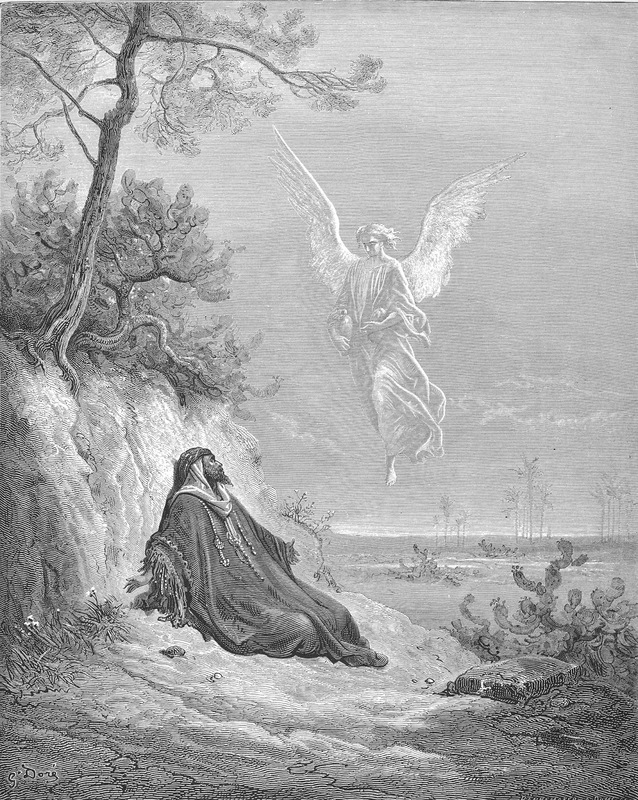 Hebrews 1–2 enumerates the reasons why angels minister to Christ with multiple comparisons to validate Christ’s superiority to angels. When Christ returns to earth, angels will also be active (1 Thess. 4:16). They will accompany Christ at his second advent (Matt. 25:31), gather in believers (Matt. 13:39–43; 24:31), and bring judgment on unbelievers (2 Thess. 1:7). An angel will bind and imprison Satan for the duration of Christ’s millennial kingdom (Rev. 20:1–3). Angels minister generally to believers (Heb. 1:14), which includes rejoicing at a believer’s salvation (Luke 15:10) and providing protection (Pss. 34:7; 35:5–6; 91:11–12; Matt. 18:10) as willed by God. Since the episode of the rich man and Lazarus (Luke 16:19–31) is most likely a parable, it should not be used with absolute certainty to argue that angels transport all believers to heaven at death (Luke 16:22). Angels can be involved in the church with regard to (1) the leadership (1 Cor. 4:9), (2) women (1 Cor. 11:10), (3) the purity of pastors (1 Tim. 5:21), and (4) their own pursuit of understanding salvation (1 Pet. 1:12). As Christ explains in one of his parables, angels will separate the “weeds” (unbelievers) from the “wheat” (believers) (Matt. 13:27–30, 36–43). An angel will preach the gospel to all the world during Daniel’s seventieth week (Rev. 14:6–7). They will participate in Christ’s second-coming judgment of unbelievers (Matt. 16:27; 2 Thess. 1:7). Angels serve God’s purposes for the nations in general (Dan. 10:13, 20) and for Israel in particular (Dan. 10:21; 12:1; Rev. 7:1–3). They will also specifically bring major judgment on all nations preceding Christ’s second coming (Rev. 8:6–11:19; 16:1–21). Holy angels will not face any judgment because they will never sin. This is in contrast to Satan and the demons, who will be judged (2 Pet. 2:4; Jude 6) and assigned to spend all eternity future in the lake of fire (Matt. 25:41; Rev. 20:10). After the final, great white throne judgment (1 Cor. 15:24–28; Rev. 20:11–15), there will be a new heaven and new earth (Rev. 21:1). The dwelling of God will be with man in the holy city, the New Jerusalem (Rev. 21:2). Where God is, there also will his holy angels be, with twelve of them at the gates to the city (Rev. 21:12). God’s redeemed people and God’s angels will worship him in righteousness forevermore. In the end, Eden will be revisited. God will look on all that he re-creates and find that it is very good—just as he did in the beginning (Gen. 1:31).